Back in 2010, I crunched the numbers from the Congressional Budget Office and reported that the budget could be balanced in just 10 years if politicians exercised a modicum of fiscal discipline and limited annual spending increases to about two percent yearly. When CBO issued new numbers early last year, I repeated the exercise and again found that the same modest level of budgetary restraint would eliminate red ink in about 10 years. And when CBO issued their update last summer, I did the same thing and once again confirmed that deficits would disappear in a decade if politicians didn’t let the overall budget rise by faster than two percent each year. Well, the new CBO 10-year forecast was released this morning. I’m going to give you three guesses about what I discovered when I looked at the numbers, and the first two don’t count. Yes, you guessed it. As the chart illustrates (click to enlarge), balancing the budget doesn’t require any tax increases. Nor does it require big spending cuts (though that would be a very good idea). Even if we assume that the 2001 and 2003 tax cuts are made permanent, all that is needed is for politicians to put government on a modest diet so that overall spending grows by about two percent each year. In other words, make sure the budget doesn’t grow faster than inflation. Tens of millions of households and businesses manage to meet this simple test every year. Surely it’s not asking too much to get the same minimum level of fiscal restraint from the crowd in Washington, right? At this point, you may be asking yourself whether it’s really this simple. After all, you’ve probably heard politicians and journalists say that deficits are so big that we have no choice but to accept big tax increases and “draconian” spending cuts. But that’s because politicians use dishonest Washington budget math. They begin each fiscal year by assuming that spending automatically will increase based on factors such as inflation, demographics, and previously legislated program changes. This creates a “baseline,” and if they enact a budget that increases spending by less than the baseline, that increase magically becomes a cut. This is what allowed some politicians to say that last year’s Ryan budget cut spending by trillions of dollars even though spending actually would have increased by an average of 2.8 percent each year. Needless to say, proponents of big government deliberately use dishonest budget math because it tilts the playing field in favor of bigger government and higher taxes. There are two important caveats about these calculations. 1. We should be dramatically downsizing the federal government, not just restraining its growth. Even if he’s not your preferred presidential candidate, Ron Paul’s proposal for an immediate $1 trillion reduction in the burden of federal spending is a very good idea. Merely limiting the growth of spending is a tiny and timid step in the right direction. 2. We should be focusing on the underlying problem of excessive government, not the symptom of too much red ink. By pointing out the amount of spending restraint that would balance the budget, some people will incorrectly conclude that getting rid of deficits is the goal. Last but not least, here is the video I narrated in 2010 showing how red ink would quickly disappear if politicians curtailed their profligacy and restrained spending growth. Other than updating the numbers, the video is just as accurate today as it was back in 2010. And the concluding message—that there is no good argument for tax increases—also is equally relevant today. P.S. Some people will argue that it’s impossible to restrain spending because of entitlement programs, but this set of videos shows how to reform Social Security, Medicare, and Medicaid. P.P.S. 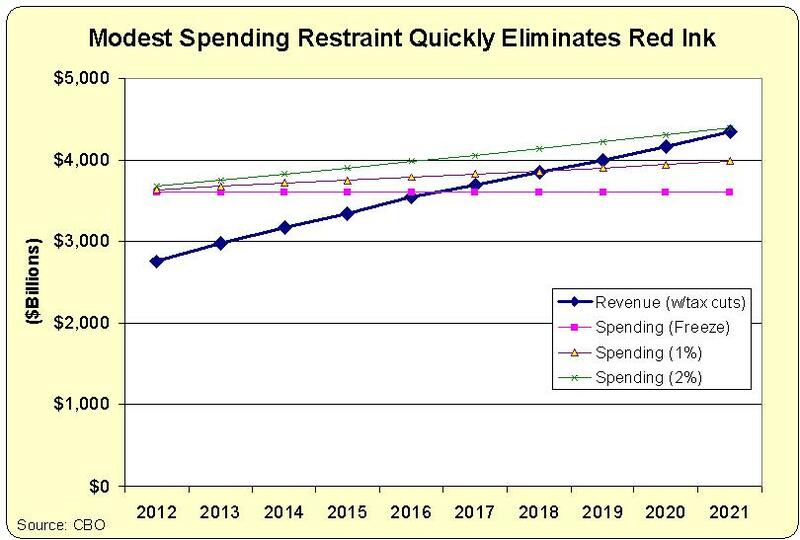 Some people will say that the CBO baseline is unrealistic because it assumes the sequester will take place. They may be right if they’re predicting politicians are too irresponsible and profligate to accept about $100 billion of annual reductions from a $4,000 billion-plus budget, but that underscores the core message that there needs to be a cap on total spending so that the crowd in Washington isn’t allowed to turn America into Greece. Who’s Winning the Race to Fiscal Destruction: Europe or the United States? Even though the unwashed masses decided that I didn’t win my stimulus debate in New York City, I continue my fight for the hearts and minds of the American people. This was a tough question. I asked the organizer whether I could vote none of the above, but I was told I had to pick an option. As you can see, I said the United States was doing a better job - but only by default. Our long-run outlook is grim, but at least we still have time to reform the entitlement programs and save America… The only major difference is that European nations are farther down the path to fiscal collapse. The welfare state was adopted earlier in Europe and government spending among euro nations now consumes a staggering 49 percent of economic output. This heavy fiscal burden, especially when combined with onerous tax systems, helps explain why growth is anemic. …the United States still can turn things around. Greece, Italy, and other welfare states have probably passed the point of no return, but it’s still possible for American lawmakers to fix the entitlement crisis by turning Medicaid over to the states , modernizing Medicare into a premium-support system, and transitioning to a system of personal retirement accounts for younger workers. If those reforms don’t take place, the consequences won’t be pleasant. To be blunt, there won’t be an IMF to bail out the United States. For all intents and purposes, I contend that America can be saved if something like the Ryan budget is approved. You can vote on this page on whether you like or dislike what I said, as well as what the other participants said. Another remarkable finding in the video is that poor people in America rarely suffer from material deprivation. Indeed, they have wide access to consumer goods that used to be considered luxuries - and they also have more housing space than the average European (and with Europe falling apart, the comparisons presumably will become even more noteworthy). The biggest beneficiaries of the current system are the army of bureaucrats that receive very comfortable salaries administering various programs. The Obama Administration is looking to re-define poverty in a way that would expand the welfare state and increase the burden of redistribution programs. The welfare reform legislation of the 1990s was a small step in the right direction because it eliminated a federal entitlement and shifted responsibility back to the state level. This success story should be replicated for programs such as Medicaid. The Census Bureau has just released the 2010 poverty numbers, and the new data is terrible. There are now a record number of poor people in America, and the poverty rate has jumped to 15.1 percent. But I don’t really blame President Obama for these grim numbers. Yes, he’s increased the burden of government, which doubtlessly has hindered the economy’s performance and made things worse, but the White House crowd legitimately can argue that they inherited a crummy situation. What’s really striking, if we look at the chart, is that the poverty rate in America was steadily declining. But then, once President Lyndon Johnson started a “War on Poverty,” that progress came to a halt. As I’ve explained before, the so-called War on Poverty has undermined economic progress by trapping people in lives of dependency. And this certainly is consistent with the data in the chart, which show that the poverty rate no longer is falling and instead bumps around between 12 percent and 15 percent. This is bad news for poor people, of course, but it’s also bad news for taxpayers. The federal government, which shouldn’t have any role in the field of income redistribution, has squandered trillions of dollars on dozens of means-tested programs. And they’ve arguably made matters worse. By the way, just in case you think I’m being too easy on Obama, read this post about how the Administration is considering a terrible plan to re-define poverty in order to justify ever-larger amounts of redistribution. I fully agree that the president’s policies definitely have made—and will continue to make—matters worse. But the fundamental problem is 40-plus years of a misguided “War on Poverty” by the federal government. President Obama just spoke about the downgrade and his remarks were very disappointing. He uttered some empty platitudes, offered no plan, (amazingly) called for more government spending, and continued his advocacy of class-warfare taxation. So what does this mean? Other than expecting volatility, I have no idea what will happen in financial markets over the next few days. But I can opine about the downgrade, Obama’s unserious response, and what it means in terms of public policy over the next few years and into the future. Notwithstanding the President’s cavalier attitude, America is in trouble. But while the crisis is severe, we have some breathing room. Our fiscal crisis is akin to a very dangerous, but slow-developing cancer. It is not a car wreck with immediate life-threatening injuries. And there are solutions, as explained in this good news-bad news-bad news-bad news-good news-good news analysis. 1. There is virtually zero chance of the United States defaulting in the next 10 years (heck, probably the next 20 years). Yes, fiscal policy has been reckless and irresponsible during the Bush-Obama spending binge, but I’m guessing it will take another 10-20 years of additional over-spending to bring America to the point of Greek-style collapse. Simply stated, the U.S. economy is so large and so rich that it can’t be destroyed quickly. 2. The United States does not deserve a triple-A rating, at least for long-term debt. The nation has a giant fiscal problem, but it’s not the annual deficit or the national debt. The true crisis is the $100-trillion-plus unfunded liability for entitlement programs - especially Medicare and Medicaid. This is why America deserved to be downgraded. 3. The left in America, as exemplified by Obama’s vapid press statement, has no serious intention of addressing this problem. The President has failed to present any sort of plan. His budget early in the year was a business-as-usual document with no reforms and even the Democratic-controlled Senate rejected it 97-0. But while Senate Democrats joined Republicans in deep-sixing Obama’s joke budget, they have failed to produce a budget of their own for more than two years. 4. The left is treating America’s fiscal crisis is an opportunity to trick Republicans into a tax increase. That would be smart politics, to be sure, since it would automatically give Democrats the upper hand, but higher taxes would probably worsen the problem of excessive government since politicians would spend any additional revenue. And the kind of class-warfare taxes Obama has in mind would further undermine growth, adding to the nation’s fiscal woes. 5. After eight years of being corrupted by “big-government conservatism,” the GOP may finally be sincere about reducing the burden of government. Led by Congressman Paul Ryan, House Republicans approved a very serious budget plan that would have reformed both the Medicare and Medicaid and substantially reduced the long-run burden on the U.S. economy. 6. America is not at the point of no return. I’ve periodically commented about the dangers of a nation reaching a tipping point, which occurs when the people riding in the wagon outnumber those pulling the wagon. But even though dependency has jumped in America, the national spirit of self-reliance, independence, and freedom remains strong. Indeed, I think that’s what the Tea Party largely represents. But none of this should suggest optimism. We know the solutions, but that does not mean that the politicians will do the right thing. As I said in the beginning of this post, America is at a crossroads. We can either continue a descent into Greek-style fiscal morass or, at some point in the next few years, we can implement reforms. But, barring some remarkable change in attitude, Obama is mostly irrelevant except to the extent that he can make matters worse by luring Republicans into a phony tax-hike deal.